A useful trick I learnt as a teenager who used to sew and mend a lot, was to use a firm edge to help push a reluctant needle through layers of fabric. The edge of a cotton reel, they were wooden then, was the usual edge of choice, although a plastic one would do, with care. The problem with all thimbles is, when used a great deal, they can become stressed and thin. Then there is a risk that pressure could push the eye of the needle through and into the end of the finger. They really ought to be changed regularly! So easy to say. Another possible explanation for the open top on dressmakers’ thimbles vs the closed top on those used by tailors: gender. Dressmakers are traditionally female; tailors more likely to be male. Women tend to have longer fingernails than men. Therefore…. Except that it’s dressmaker’s thimbles that have the closed top, and the tailor’s ones that have an open top. I remain mystified in the difference. Whoops! Need to read more closely. 🙂 ‘Tis a puzzlement. Maybe somebody will come along and explain it all to us. Fingers crossed! I have never been able to learn to use a thimble and have shredded fingertips because of that. 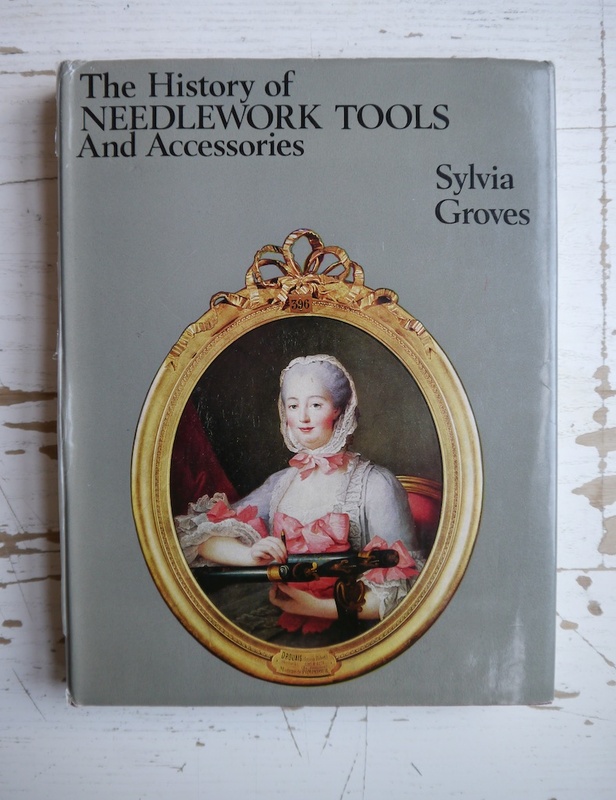 I discovered you via an article on my OCA website, about darning and creative ways of mending, which I immediately put into practice. I am thinking about starting a mending group in my village in Dorset, because I enjoy it so much, and because I think there are many people who just never think of mending things. I also discovered your creative work on Kate Davies’ wonderful blog. If you want to start your own mending group, then one place to look for more information on how to go about it, is the Repair Café Foundation. They have an information pack and everything. Happy mending! Lovely, thank you for your helpful suggestion! It takes me one step further. Although I’m a hand quilter and patchworker I’m not really a lover of thimble wearing and by the time I’ve finished a quilt my poor fingertips need more than a soak in cold tea (something I was told ballerinas do at the end of hard day with their feet…it seems to take the heat out)…however I find wrapping a small piece of cotton cloth over my finger before tucking it into a roomy thimble makes the thimble feel a bit less odd to wear, I still end up wanting to favour the next finger along but this does seem to help a little…I shall look forward to reading about your thimbling progress with interest…. I need to find a tailor’s thimble! I can’t sew without a thimble, but I don’t use the tailor technique of resten my middle finger against my palm, i use it to push. I think, lol. Need to do some hand sewing now to figure out what I do. I have a closed top thimble with a rim, which I like, as the needle stays put and don’t slide. The indentations are als rectangular, and grab the needle quite well. 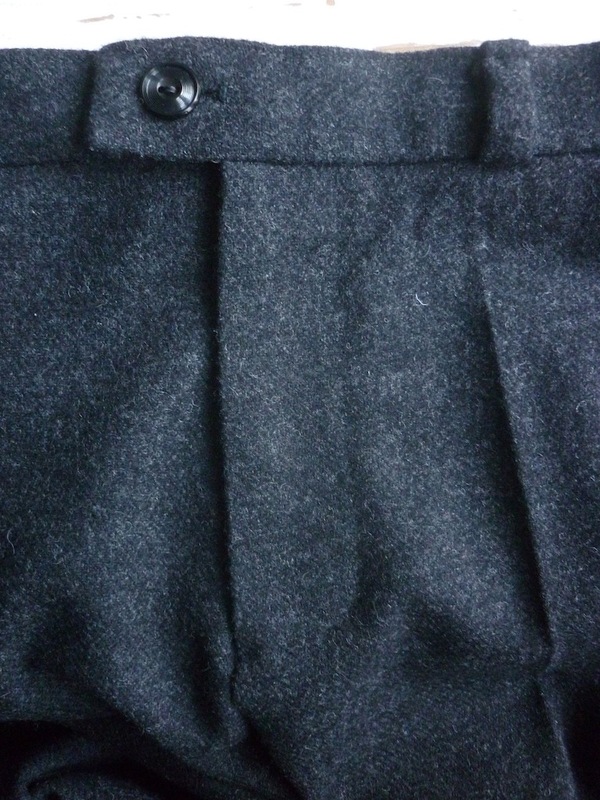 Then of course there’s a leather thimble by clover, which is like a glove. One side has a metal insert, the other just double layer. What I really like is that when sewing through layers where the needle tends to get stuck, I just turn it around, and grab the needle with the leather. good luck with your training, the technique looks difficult to my eye, as I use the ‘dressmaker’ technique of pushing the back end of the needle with my middle finger-why is the tailor one better by the way?and what is the difference between tailor/ess and dressmaker? is it a question of standard of execution? I was also wondering whether one technique is better than the other or whether this might be a gender thing – that tailoring is more highly regarded because it has traditionally been a male domain. That being said, tailors (in documentaries) seem to be very effective at sewing, but then again, they usually have 60+ years of daily experience. I have also despised thimbles, mainly because they do not fit and make my nails hurt. However, I do rather like my leather coin thimble by Clover – the leather absorbs moisture, the thimble moulds to the finger (when in doubt, purchase the smaller size) and the coin is in the right place for tailors’ techniques as well, I think. 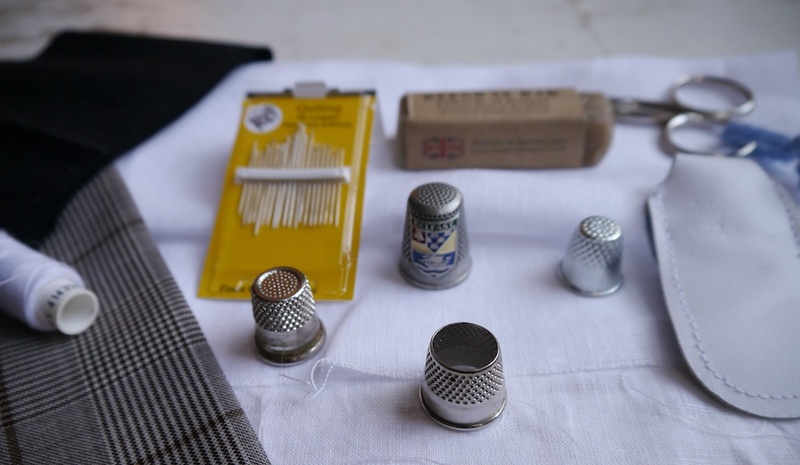 Having had a chance to be taught how to make, as well as use a sashiko thimble, and usually using a closed top dressmakers thimble I could speculate that it is the needles that make the difference, as you have noted. I’m not sure what type of needles that tailors use, but I would assume that the type of needle or the stich making style would account for the different structure. I couldn’t believe that one type is inherently ‘better’ than the other, rather it’s a question of being fit for purpose. Tailors usually use betweens, sizes 5, 7, and 9. I read somewhere that dressmakers traditionally use sharps. These are longer, and having tried my tailor’s thimble with both sharps and betweens, I did notice that the technique used by tailors (pushing the needle through with the nail of the middle finger) is easier with the shorter needle. Perhaps that’s the answer. So enquiring minds would like to know why tailors use betweens, and dressmakers use sharps! I’ve been hand sewing since the age of six (geeze that’s over 50 years) and have almost always used a thimble. A few years back my knitting bag was stolen when my car was broken into. My knitting kit held my favorite thimble from high school. It is the item that I have missed the most from that event. I’ve tried a few new thimbles, none of which fit because my hands are small. Recently I discovered my mother-in-law’s sewing basket (She has been dead 40 years) in a basement. Her thimble fits me perfect! While style may or may not make a huge difference in using thimbles, size does. Find one that fits snugly on your middle finger and doesn’t pop off at the drop of a hat. 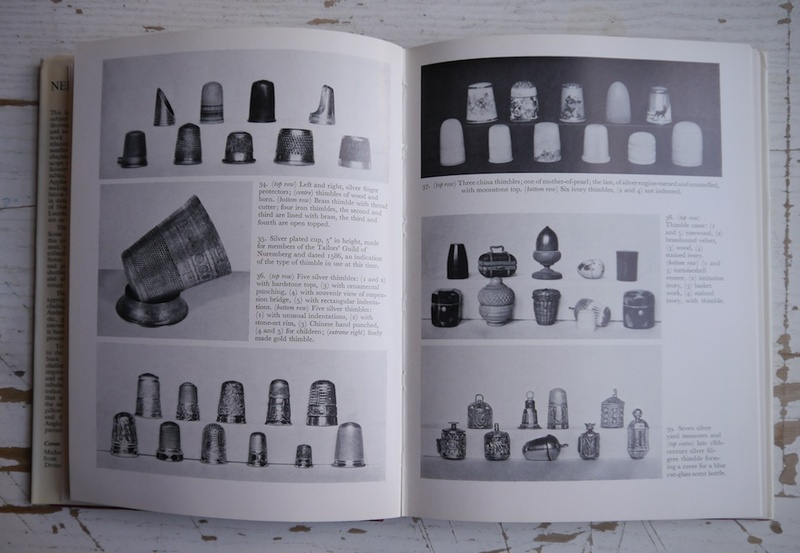 I too hate using thimbles, but I recently found a tip in a new book. A blob of superglue on the finger. It takes a while to dry and you have to be careful not to stick your fingers together, but it works! I do a fair bit of hand sewing, and I always use the leather quilters thimble. With a bit of use it forms to your finger and I don’t mind it at all. I use it around my middle finger, and use not the nail but the top inside of my finger to push the needle through. I learned this 20 years ago and use it always. The metal thimble I have is a bother to me. The leather has a piece of elastic at the top, to keep it snug. I inherited my Grandmothers thimble. She had made about 75 quilts in her life time, all hand quilted. The thimble is worth out, it actually has holes in it. I have never been able to wear a thimble. No matter what finger I put it on I’ll use the finger next to it. I now use the Ultra Thimble. It is metal and has tape to hold it on. I hardly know it’s there. Often I forget it’s there and walk around with it on. I tried the Thimble Pad but my needle would pierce the padding and it slowed me down. Don’t get the smooth one, I found the one with dimples works the best. Hi Tom, I could never wear a thimble no matter how hard I tried- it just wasn’t comfortable & felt completely foreign trying to sew with the thimble on my finger. In desperation, I tried a leather ‘quilter’s thimble. I can honestly say that it changed my life. 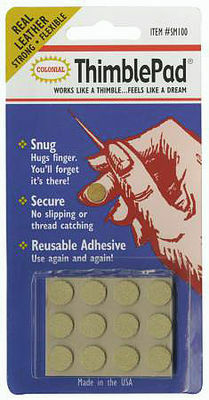 I got one that was quite a snug fit & after using it for a very short time, I found I was able to easily use a thimble. I do a lot of hand sewing as I really enjoy it, but I didn’t enjoy the needle going through my fingertip. Maybe it’s something you could try?